A Glossary of Navigation Terms. I hope this brief glossary of navigation terms will be of assistance to those wishing to improve their navigational skills. Actual depth; the true depth of water as opposed to a predicted depth. Tidal height from table added to the charted depth. Almanac; an annual publication containing Tide Tables astronomical ephemerals etc. Altitude; the angular distance of a celestial body above the viewers horizon. Anabatic Winds; caused by warm air rising up a slope to be replaced by cooler air, as opposed to kabatic, descending winds. Apparent wind; the wind as felt on board, this will be the actual wind modified by the wind created by the vessels movement. Aries; the constellation of the Ram in the Northern Celestial Hemisphere, see also, First Point of Aries. Astrolabe; an instrument used to determine the altitude of celestial objects before the introduction of the sextant. The first recorded use by Greek astronomers in around 200 B.C. Azimuth; the horizontal angular distance from a reference position to a celestial body, usually measured clockwise in degrees from the direction of the nearest pole. Barometer; an instrument for measuring atmospheric pressure. Barometric Gradient; the rate at which atmospheric pressure rises of falls. Beacon; an unlit navigation mark. Bearing; the compass reading taken of a object in relation to the observer. Beaufort Scale; a numerical method of describing wind strength. Cape; a piece of land that that projects out into a large body of water. Cardinal Marks; buoyage marks indicating the direction of safe water with reference to the cardinal points. Cardinal Points; the four main points of the compass, North, East, South and West. Cartography; the study and the construction of maps. CC or Compass Course; the course to steer which has been corrected for current, variation, and deviation. Celestial navigation; a method of navigating by referring to the stars or other objects in the sky. Celestial sphere; an imaginary sphere with the earth at its center, on whose surface the stars, planets and other heavenly bodies appear to be situated. Characteristics; the distinctive pattern of flashes used to identify a light. Chart datum; the reference level on charts to which tidal heights are referred. Charted depth; the depth shown on the chart for a particular point on the sea bed. Circumnavigate; to travel around the entire Earth. Civil twilight; times given in the almanac, for listed latitudes for approximately the best time to take a morning or evening sight, when both the horizon and the heavenly bodies are visible. CMG; the Course Made Good is the course over the ground. Cocked hat; a triangle formed by a series of three LOPs which do not meet at an exact point. 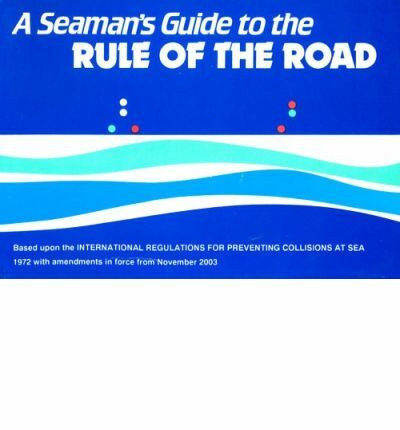 COLREGS; the international rules for prevent of collisions at sea. Compass; a device that always points towards magnetic north, used for navigation. Compass Rose; is a design on a chart that shows direction. It points which way is north, south, east, west, and some intermediate directions. Conversion tables; used to convert units of one system to units in another. Copernicus; 1473-1543, Polish astronomer credited with disproving the Ptolemaic System. Course; the direction in which a vessel is heading or is intended to be steered, the direction through the water. Course made good; the direction in which the vessel is actually traveling as opposed to the direction in which it is pointing. 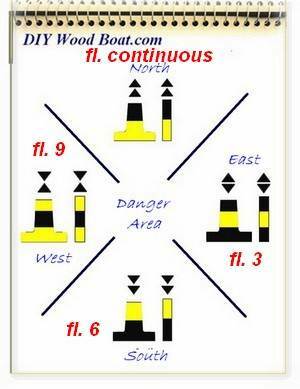 Corrections; alterations made to charts to update navigational information. Cross bearing; using LOPs from several navigational aids or marks to obtain a position fix. Crux; the Southern Cross a constellation seen in the southern hemisphere. 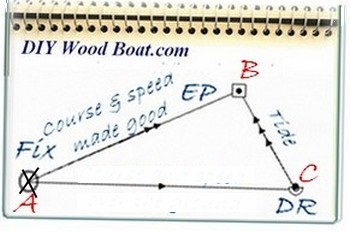 Dead reckoning; determining a position by plotting courses and speeds from a known position. Declination; the angular distance to a point on the celestial sphere measured north and south from the celestial equator along the hour circle. Deviation; the compass errors caused by metallic o magnetic objects on board the vessel. Dip; a correction to be applied to sextant attitudes to compensate for height of eye above sea level. Doldrums; the Inter-tropical Convergence Zone (or ITCZ) a belt of very still air between 5 degrees north and 5 degrees south of the equator. Drift; the speed in knots of the effect of current or tide on a vessel's progress. Drying height; the height above chart datum, on a chart, of any areas which are uncovered at low water. 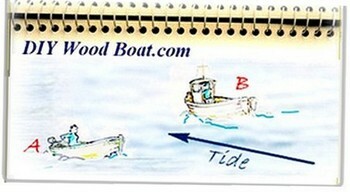 Duration of tide; the time between high an low water, normally just over 6 hours. Electronic logs or E log books; a method of standardising the keeping of logs digitally on commercial vessels. Electronic charts; there are two different types see Vector charts and Raster marine charts. ENT; , Evening Nautical Twilight. EP; Estimated Position, the DR plus the effects of current. Ephemerals; a published collection of tables giving coordinates for astronomical bodies for specific times. Estimated Position; a DR position which has been adjusted to allow for Set and Drift. ETA; estimated time of arrival. Equator; an imaginary circle around the earth, halfway between the north and south poles. Fathom; an old fashioned unit of measurement to measure depth, approximately equal to 6 feet or 1.8 meters. First Point of Aries;a point on the celestial sphere which is used as a reference point, it is in fact where the ‘Ecliptic’ and the Celestial Equator cross. Fix; a position verified by reference to bearings take off a known point such as a conspicuous land mark. Flotsam; the floating debris resulting from a shipwreck. Forecasting Terms; used to convey specific, concise, information on weather conditions. Geographical Position or GP; in celestial navigation it is the point on the earths surface directly beneath the Zenith, and the bit of the surface you are standing on is your body’s Geographical Position or GP. GMT, Greenwich Mean Time; now referred to as UTC, Coordinated Universal Time, or UT, it is the mean of the times of noon at the Greenwich Meridian. GPS, Global Positioning System; a system which uses information broadcast from orbiting satellites to calculate the longitude and latitude of a receiving device. Greenwich meridian;the Prime Meridian it is the 0°longitude line, it is referred to as the Greenwich Meridian because it passes through the Royal Observatory at Greenwich in the UK. Gyrocompass; a non magnetic type of compass. Hand held, Compass; a small portable compass. Heading; the direction in which a vessel is pointing, as opposed to the course made good. HE, Height of Eye; the height of a sextant user’s eye above sea level, needed to add as a correction to a site reduction. Height of tide; a figure taken from the tide tables indicating the depth of water above the chart datum. Horizon; the apparent line, for an observer where the earth’s surface and the sky meet. Also a circle formed on the celestial sphere by a plane tangent to a point on the Earth's surface. Horse Latitudes; See Doldrums and ITCZ. Index mirror; the mirror at the apex of a sextant frame which pivots with the index arm. Intercept; where two or more lines such as LOPs cross. International Date Line; the imaginary line in the Pacific Ocean at which the date changes. This line varies from the 180⁰ meridian to avoid populated land areas. International marine signal flags; a system of flag shapes and designes used to communicate messages at sea. Interpolation Tables; almanac tables to estimate value between the tabulated results. ITCZ, Intertropical Convergence Zone; the varying area of normally still air lying approximately between 5⁰ north and south of the equator. Jetsam; are objects that have been thrown overboard from a vessel, originally stuff jettisoned by a ship which was in trouble. Knot, (Kts. ); a unit of speed, nautical miles per hour. Landfall; the approach to or sighting of land after an ocean passage. Lateral Marks; buoyage indicating the edge of a safe water channel. Latitude; the angular distance north or south from the equator on the earth surface. Leading lights or Range Lights; a pair of lights deliberately placed to provide a transit along a narrow channel. Leading or Range marks; transit markers. Leeway; sideways movement of a vessel usually caused by the wind. Limb; when taking a sun or moon sight it is difficult to guess where the center is so the observer aligns either the top edge (Upper Limb) or more usually the bottom edge (Lower Limb) of the object on to the horizon. The sight is then corrected using the appropriate correction tables. Line Of Position, LOP; a line drawn on a chart on which the position of the vessel must lie. The line deduced from either a compass bearing of a mark or a sight reduction. A minimum of two or preferably more are necessary to establish a fix. Local Noon; the time when the sun reaches its highest altitude at your position and is directly north or south of you. it will then be at your Zenith and its GHA will correspond to your longitude. Local time; solar time at your position. Local Hour Angle, LHA; the angular distance of an observed celestial object to the west of the observers meridian. Localized weather phenomena; alterations made to the prevailing weather by local topography. Log; an instrument used to calculate speed and distance travelled, through the water. Longitude; the angular distance east or west from the Greenwich or Prime Meridian (0⁰) on the earth’s surface. Lower limb; see Limb. LOP; see Line of Position. Magnetic Compass; a device used for navigation which aligns with the earths magnetic field thus indicating th direction of magnetic north. Magnetic bearing; a baring taken from a magnetic compass. Magnetic north; the northerly position of the earths magnetic field, this is varies from the True North. Making; used to denote progress, as in making way or a rising tide as making. Mark; a fixed buoyage indicator. Mercator projection; a method for representing the spherical globe as a flat map with lines of latitude and longitude intersecting at right angles. Devised by Geradus Mercato in 1569. Meridian; a line of longitude, the imaginary great circles on the surface of the earth which converge at the poles and have their center at the center of the earth. Nautical mile; a unit of distance that is equal to 1/60 of a degree as measured along a line of longitude at the latitude of the distance to be measured. Navigation; the process of plotting and directing the course of a vessel. Neaps; the lowest tides in the tidal range, occurring when the sun and moon are in quadrature. Notices to Mariners; updates and corrections to chart data. Parallax; the apparent differences in the positions of objects viewed along different lines of sight. Passage plan; a written plan of a proposed voyage. Pilot book; a guide book giving details of coastlines and harbours and sailing directions. Pilotage plan; a navigation plan for a passage. Plotting Sheet; a paper sheet separate from the cart where a navigator can plot his LOPs and the vessels course. Ptolemy; Claudius Ptolemaeus, c. AD 90 to c. 168 a Roman mathematician, astronomer, geographer, possibly of Greek or Egyptian origin. Quadrant; a precursor to the sextant as an instrument used to measure altitudes up to 90° or one quarter of a circle, hence the name. First proposed by Ptolemy as an improvement on the astrolabe. Range; the distance at which a light or mark can be seen from sea level. Also the difference between the height of low water and high water. Range Markers, or Transits; marks or lights which when in line indicate a safe channel. Raster marine charts; electronic charts which conform to IHO specifications are produced by scanning a paper charts. Rhumb line; a course sailed using a constant compass course. An imaginary line drawn on a chart which crosses all the meridians at a constant angle. Rule of Twelfths; a method for making quick estimations of tidal height. See also Rule of tenths. Running fix; advancing a LOP or previous line of position forward to a current line of position. A fix based on two separated bearings of the same fixed object and the distance run between the bearings. Secondry port; in the Tide Tables this is a port where the details have to be worked out in relation to a Standard Port. Sector Lights; light emitted from a single position which will show up as either red, white or green depending on the angle of the observer, designed to indicate a safe navigational area. Semi-diurnal; occurring twice per day. Set; the direction towards which a Tide or Current is flowing. 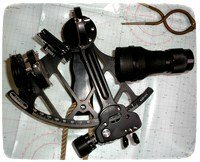 Sextant; an instrument used to measuring angular distances, like the altitude of the sun, moon and stars for navigation. Sidereal Hour Angle (SHA); the angular distance of a star from the First Point of Aries. Slack water; the interval at high and low water where the stream ceases momentarily before changing direction. Snellius construction; a method for combining three compass bearings to obtain a position fix, one where magnetic variation and deviation need not to be taken into account. Sounding; a method of measuring the depth of water. Soundings; water shallow enough to allow depth to be measured by lead line. South Magnetic Pole; the southerly point toward which a compass' needle always points, the south of the earth’s magnetic field as opposed to the geographic south pole. Special Marks; buoyage indicators of special areas or objects mentioned on the charts or in other nautical and publications. Speed Made Good, SMG; the actual speed over the ground as opposed to through the water. Spring tide; where the rise and fall or range of the tide is greatest, occurring around the time of the full and new moon. Standard port; a port for which the Tide Tables give full details and from which Secondary Port details con be extrapolated. Strait; a narrow channel of water connecting two larger bodies of water. Synoptic charts; a diagrammatic representation of weather data, summarised and overlaid on a chart. Taking off; the opposite of Making. Tidal Diamonds; a method for showing tidal information on a nautical chart. Tidal race; where the tidal stream creates confused and sometimes dangerous water. Tidal stream; the horizontal flow of the tide. Top mark; the distinctive shape on top of a buoy. Track; the plotted course of a vessel. Trade winds; steady easterly winds that blow through the tropics and subtropics. Transit; two fixed objects in lined up by an observer. Transit fix; a method of lining up charted objects to obtain an LOP. Transit Markers; see Range Markers. Universal Coordinated Time, UTC or UT; the time at the Greenwich or 0⁰ meridian, GMT, Zulu time. Variation; the angle between True North and Magnetic North. Vectors, tidal for plotting EPs. Vector charts; a type of electronic chart. Way Points; navigation positions as entered in a GPS. Westerlies; are the prevailing west-to-east winds of the middle latitudes of both hemispheres on Earth. Zenith; the point directly above the observer’s head. Zone Time, ZT; the clock time within each meridian. Zulu time; see Universal Coordinated Time. I will be adding more Navigation Terms when I think of them. In the mean time, if there is a navigation term you would like to know more about let me know using the comment form below.